The Vertical Gas Smoker features 770 sq. in. total cooking surface / 4 cubic feet overall cooking capacity, 4 fully adjustable 5mm stainless steel cooking grids, 1 multi-purpose roast / rib rack, Roto-Draft™ damper technology, Sure-Lite™ electronic ignition system, Accu-Temp™ thermometer, and 16 stainless steel meat hooks. Additioanl features include double walled construction, fold down grease tray, and secondary door for easy access to the extra large stainless steel water bowl and smoker box. 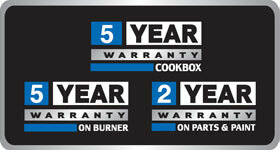 Warranty: 5 years on casting, 5 years on burner, 2 years on all other parts.